For Breakfast had a toasted healthy Life Whole Grain English Muffin topped with Smucker’s Sugar Free Blackberry Jam and a cup of Bigelow Decaf Green Tea. Right after Breakfast I headed to Meijer, wanted to go early and get back. Back home I had to break out the leaf blower, the driveway and deck was littered with leaves and twigs from the wind of the last couple of days. Had lunch and after that headed to the hospital to see Dad. He might be released this weekend, he looks so much better! Back at home finished up some laundry for Mom and then on to some light house cleaning. Busy, busy day! 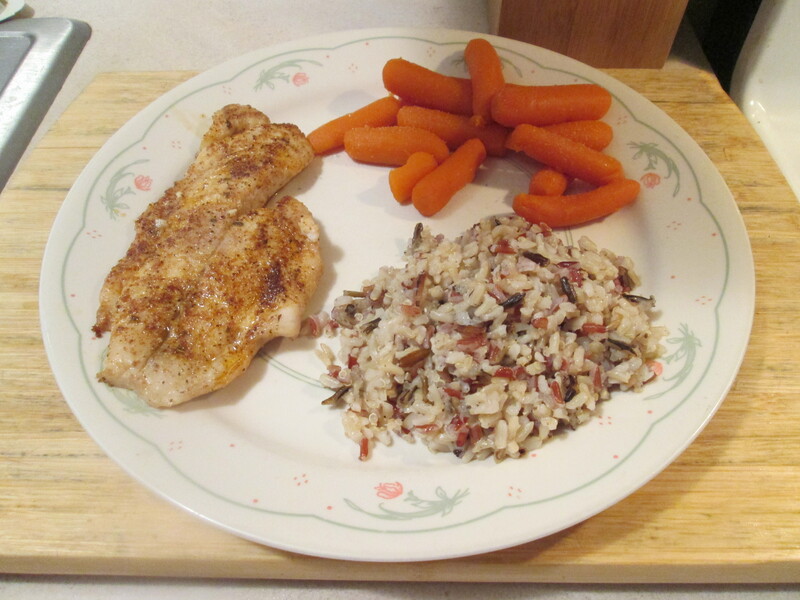 Finally for dinner tonight I prepared a Blackened Gulf Coast Grouper w/ Multi Grain Medley and Baby Carrots. I had been preparing the Red Snapper my friends had brought back from the Florida Gulf Coast, which I used all of it. So now I broke out the Grouper that they had for me. I got one of the fillets out of the freezer and let it thaw overnight in the fridge. It’s one beautiful Grouper fillet! To prepare it I rinsed the fillet off in cold water and patted it dry with paper towel. I then seasoned them it with a bit of Sea Salt. Then I melted 1 tablespoon of Blue Bonnet Lite Butter and rolled the fillet in the Butter. 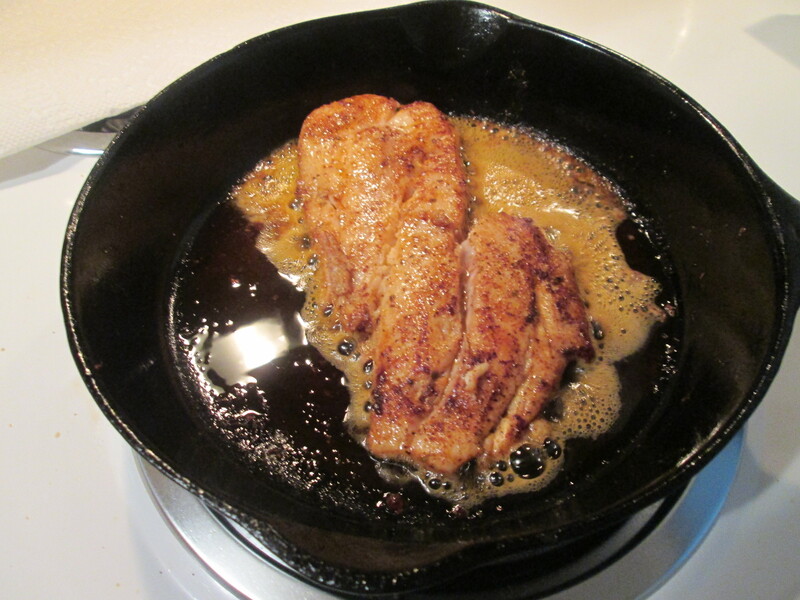 I then added the Zatarain’s Blackening Seasoning, coating both sides of the fillet. I prepared it in a preheated Cast Iron Skillet that I sprayed with Pam Cooking Spray. 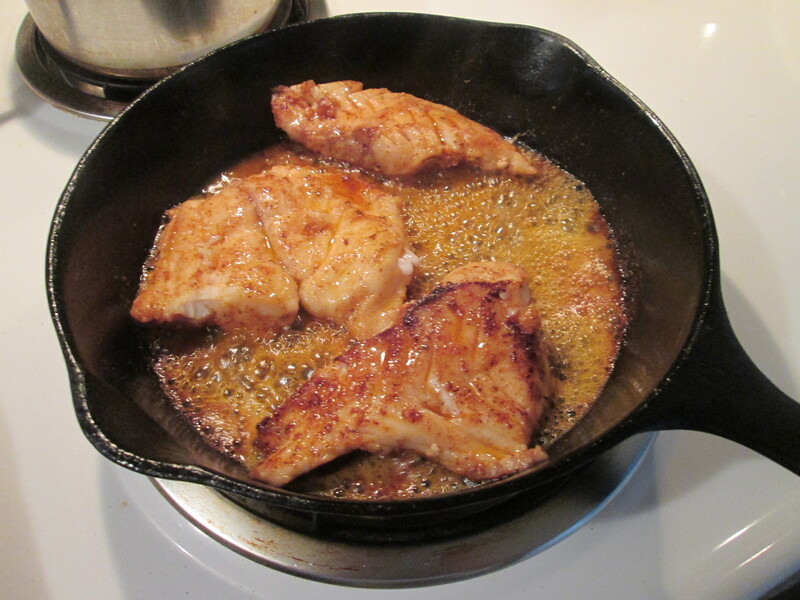 When the pan was fully heated, on medium heat, I added my Grouper. At this point turn on your Stove Overhead Exhaust Fan on, because it will start smoking from the seasoning. Cooked it about 4 minutes per side, and it was ready! Cast Iron Skillets are perfect to use for any cooking but especially when you Blacken something. The Skillet heats up and holds it heat and the heat evenly distributes across the Skillet, perfect for Blackening Meats. This is one delicious Grouper! The fresh taste of the Grouper along with the Blackening Season are a perfect combo. Love Fish, Love Seafood! For one side dish I prepared some Minute Multi Grain Medley. 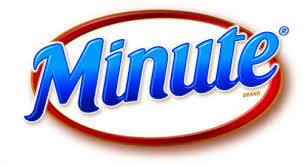 I love the Minute Multi Grain, It has Brown Rice, Thai Red Rice, Wild Rice, and Quinoa. Now that’s a good combo of Grains! Plus it’s only 160 calories and 31 net carbs per serving, which isn’t bad for a Grain Dish. Then I also prepared a can of Kroger Brand Whole Baby Carrots. These are so much easier to prepare than boiling fresh Baby Carrots, and they taste just as fresh and good. For dessert/snack later a 100 Calorie Mini Bag of Jolly Time Pop Corn. Busy day around the house today. We are having a new roof put on the house and our shed today. Which also means a whole lot of noise. Another beautiful Fall day out again, we are on a roll weather wise. Sunny and a high in the 70’s. Did a load of laundry for Mom and cleaned up around the house. Didn’t get to go see Dad today, I had to stick around the house while the repairs are going on. 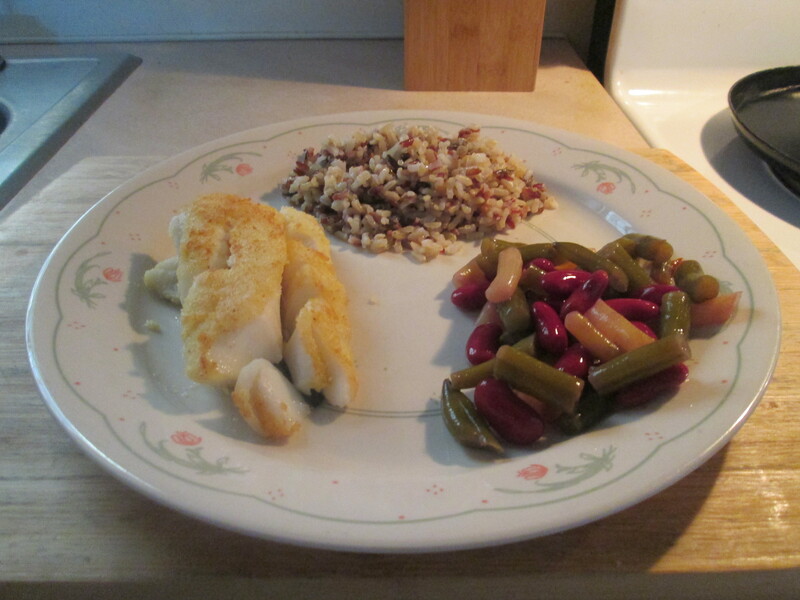 For dinner tonight I prepared a Seasoned Haddock w/ Multi – Grain Medley and 3 Bean Salad. Well they finally had Haddock back in stock at the Kroger I go to. They told me a couple of weeks ago they were no longer going to carry it, they just weren’t selling enough of it. But Monday when I was there they said they had brought it back due to so many complaints. Anyway I purchased 3 nice size fillets that I’ve already cleaned and cut into smaller fillets and put in the freezer. I did keep some out for my dinner tonight. 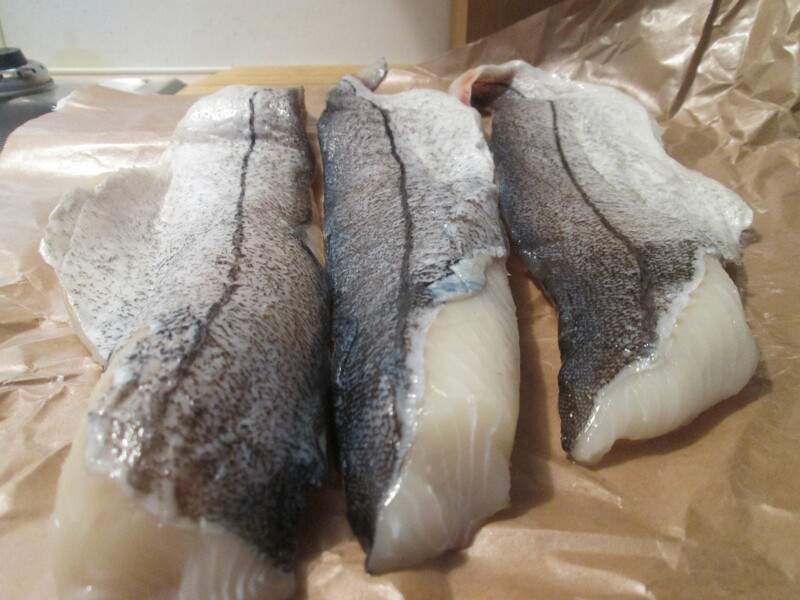 I love Haddock it cooks up so nicely and I love the flavor and how meaty it is. So to prepare it I had cut the fillet into smaller pieces. I then seasoned it with just a bit of Sea Salt and put the pieces in a Hefty Zip Plastic Bag where I then added Zatarain’s Lemon Pepper Breading Mix. Shook until all the pieces were well coated. Shook off the excess and pan fried them in Extra Virgin Olive Oil, frying them about 3 minutes per side until golden brown. 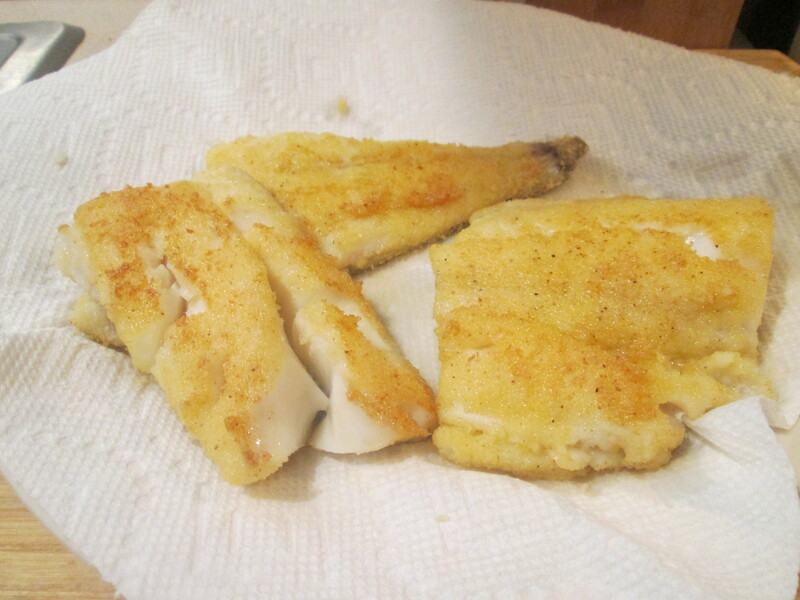 Haddock and Zatarain’s Lemon Pepper Mix, the perfect combo. The Zatarain’s Breading and Seasonings are my favorites. Love Haddock! For one side dish I prepared some Minute Multi Grain Medley. 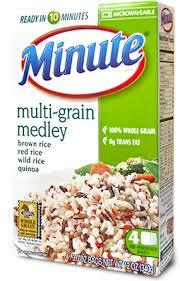 I love the Minute Multi Grain, It has Brown Rice, Thai Red Rice, Wild Rice, and Quinoa. Now that’s a good combo of Grains! Plus it’s only 160 calories and 31 net carbs per serving. 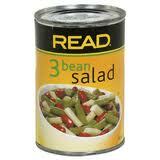 I also had some Read’s 3 Bean Salad. It comes in a can and you can prepare it various ways. I just opened the can and put it in a plastic bowl, put the lid on, and set in the refrigerator to chill for a couple of hours or so. I served these chilled. For dessert later a Healthy Choice Vanilla Bean Frozen Greek Yogurt. Fresh green and yellow string beans, wholesome red kidney beans, spicy onions, and red peppers in delicately flavored tangy vinaigrette are what our 3 bean salad is all about. For added flavor and a different twist, try our 4 bean mixture with garbanzo beans. Made with the finest kidney and black beans, whole kernel corn, hominy, and red and green peppers, our read southwestern bean salad is a remarkably versatile product. It’s perfect for use in wraps, tacos, burritos, or as a main dish by adding shredded chicken or beef. Use in a dip with tortilla chips or put some on a bed of lettuce topped with tomatoes to create a healthy, nutritious salad. A little warmer out and some rain coming in overnight and tomorrow. Did some laundry for Mom and cleaned up inside and outside the house. Everything done and I went to the rehab center to see Dad for a couple of hours. He’s slowly regaining his strength but has a way to go. On the way back home stopped and had the car washed, which was much needed. 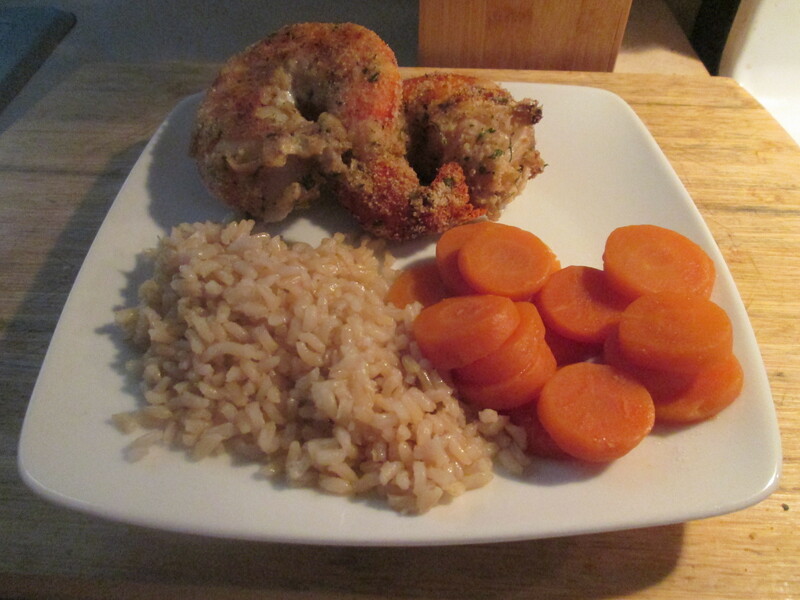 For dinner tonight Colossal Shrimp w/ Whole Grain Brown Rice and Sliced Carrots. While at Jungle Jim’s yesterday I picked up some Ocean Perch, Grouper, and a package of 2 Colossal Shrimp. And I mean Colossal Shrimp! Love the Seafood Department there at Jungle Jim’s. Fish, Shrimp, Lobsters, Crabs, they have it all. They even have tanks of live Trout, Tilapia, Striped Bass, and Lobsters that you can choose your Seafood from. So when I seen this package of the Shrimp I had to get it! I wasn’t sure on how to prepare them so I looked around the net for recipes. I ended up combining 3 different recipe ideas for my Shrimp. To make them I’ll need the following; 1/4 cups dry Progresso Italian Style Breadcrumbs, 2 tablespoons Kraft Reduced Fat Grated Parmesan Cheese, 1/2 teaspoon Dried Parsley, 1/2 teaspoon Garlic Powder, 1/2 teaspoon Sea Salt, 1/2 teaspoon Ground Black Pepper, 2 tablespoons melted Blue Bonnet Light Butter (slightly cooled), 1 tablespoons Extra Virgin Olive Oil, 1 tablespoons fresh Lemon Juice, 1 teaspoon Garlic Powder, and 2 Colossal Shrimp. To prepare them I preheated the oven on 425 degrees. I then rinsed the Shrimp in cold water, peeled the shells, and cleaned again. Then in a shallow dish combined the breadcrumbs with Parmesan cheese, dried parsley, garlic powder, sea salt and black pepper; set aside. In a large bowl whisk together melted butter with 1 tablespoon oil, fresh lemon juice. Add in shrimp and toss to coat with the melted butter mixture; allow to sit out at room temperature for about 20 minutes. Lighty grease a cookie sheet pan. Remove the shrimp from the butter mixture allowing any excess to drip off the shrimp, then lightly coat both sides in the breadcrumb mixture. Place the coated shrimp onto the pan but not touching each other. 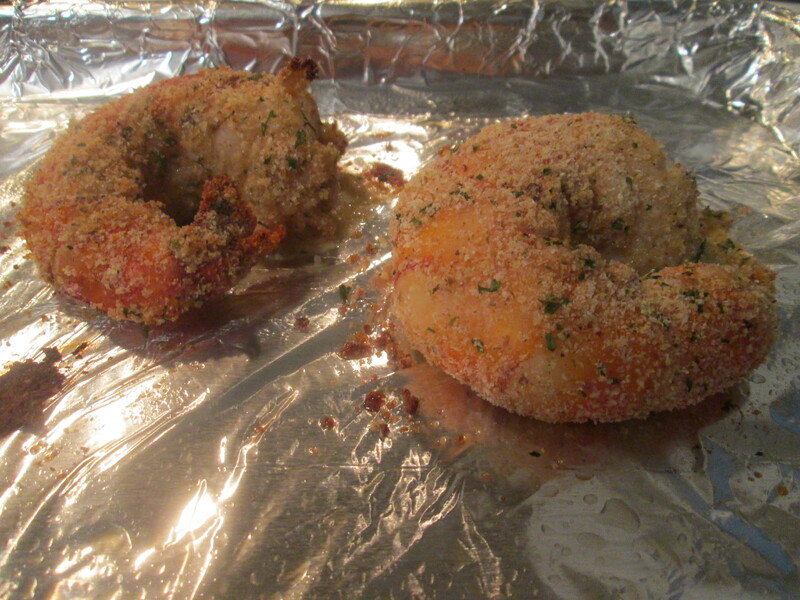 Bake for about 10 minutes or until the shrimp are cooked through (baking times will vary for size of shrimp). These Shrimp were so sweet and meaty itwas like having Lobster! I served them with a Cerulean Seas Mango Coconut Dipping Sauce, picked this up at Jungle Jim’s also. If you come across any of this sauce, grab a bottle or two. Just incredible, this would great for any Seafood! For one side dish I microwaved some Uncle Ben’s Natural Whole Grain Brown Rice. It comes in a single serving microwavable container. Just heat for 45 seconds and serve! Rice comes out perfect, steaming hot and fluffy. I also heated up a can of Del Monte Sliced Carrots. For dessert later a Jello sugar Free Dark Chocolate Mousse. 1 – In a shallow dish combine the breadcrumbs with Parmesan cheese, dried parsley, garlic powder, seasoned salt and black pepper; set aside. 2 – In a large bowl whisk together melted butter with 2 tablespoons oil, fresh lemon juice. 3 – Add in shrimp and toss to coat with the melted butter mixture; allow to sit out at room temperature for about 20 minutes. 4 – Lighty grease a cookie sheet pan. 5 – Remove the shrimp from the butter mixture allowing any excess to drip off the shrimp, then lightly coat both sides in the breadcrumb mixture. 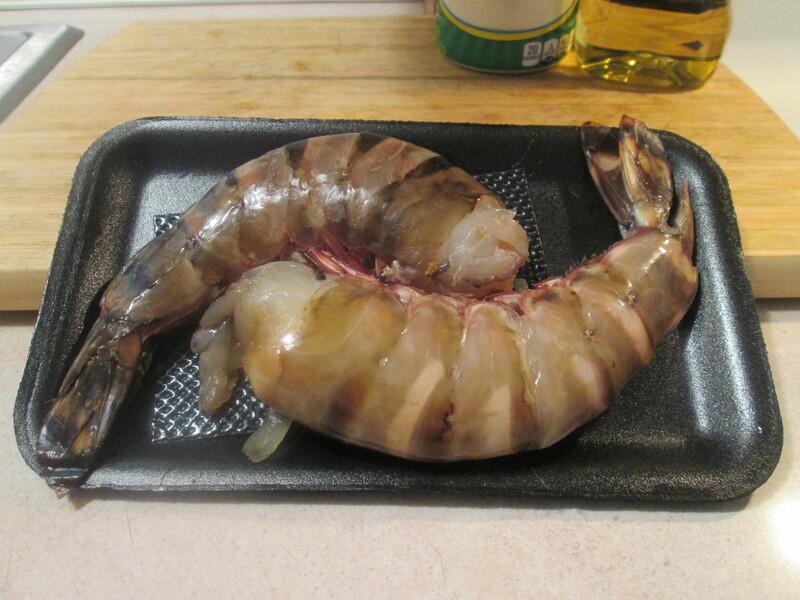 6 – Place the coated shrimp onto the pan but not touching each other. 7 – Set oven to 425 degrees (set oven to second-lowest rack). 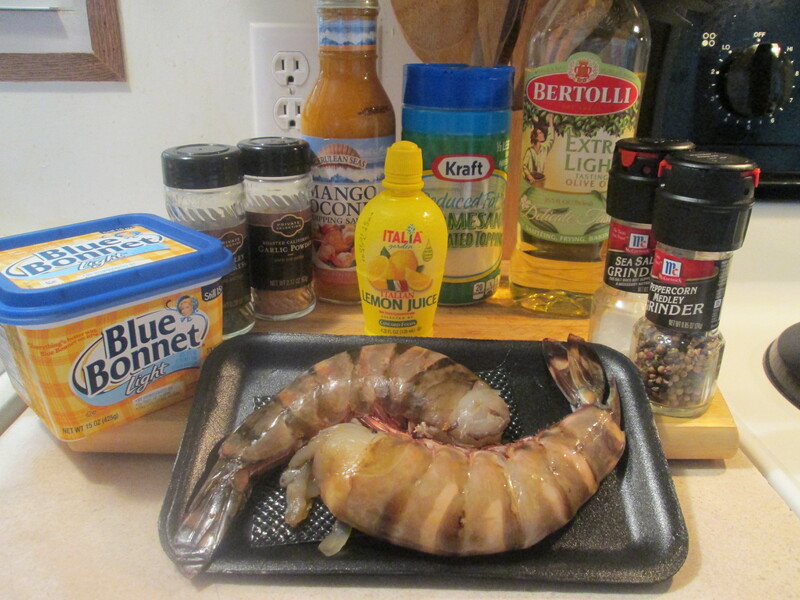 8 – Bake for about 10 minutes or until the shrimp are cooked through (baking times will vary for size of shrimp). Still using the Yellowtail Snapper a friend brought me from fishing the Florida Gulf Coast. Brought me back Grouper and the Yellowtail Snapper both, love the Snapper as much as I do the Grouper. And like the Grouper it can be prepared so many different ways, and all of them delicious! The Snapper was in the freezer so I laid it in the fridge overnight to thaw. To prepare tonight’s fillets I blackened them. I love to blacken any Fish, just so flavorful. I’m using Zatarain’s Blackening Season, which I almost always use. To prepare the fillets I rinsed them off in cold water and patting dry with paper towel. I melted a tablespoon of butter, Blue Bonnet Light Stick Butter. I then brushed both sides of the fillets with the melted Butter and seasoned them with Sea Salt and then with Zatarain’s Blackened Seasoning. I then I got out my favorite skillet, The Cast Iron Skillet. When the pan was fully heated, on medium heat, I added my Snapper. At this point turn on your Stove Overhead Exhaust Fan on, it will start smoking from the seasoning. Cooked it about 4 minutes per side, and it was ready. Cast Iron Skillets are perfect to use for any cooking but especially when Blacken something. The Skillet heats up and holds it heat and the heat evenly distributes across the Skillet, perfect for Blackening Meats. This Snapper turned out so good, moist and bursting with flavor. Just something about the Gulf Seafood. The Zatarain’s Seasonings are perfect for any Seafood. Served it on a bed of Minute Multi Grain Medley. I love the Multi Grain, It has Brown Rice, Thai Red Rice, Wild Rice, and Quinoa. Now that’s a good combo of Grains! Plus it’s only 160 calories and 31 net carbs per serving, which isn’t bad for a Grain Dish. Then I also boiled some Baby Carrots for the other side dish. Grains and Carrots are a natural pairing to me. For dessert later a Healthy Choice Dark Fudge Swirl Frozen Greek Yogurt. The yellowtail snapper, Ocyurus chrysurus, is an abundant species of snapper native to the western Atlantic Ocean including the Gulf of Mexico and the Caribbean Sea. Identified by a yellow stripe that runs the full length of the body from forward of the eye to the deeply forked yellow tail. The stripe is vivid in young fish, but pales with maturity. Color above the line is bluish with yellow patches; silvery white below. No prominent teeth as in most other Snappers. The yellowtail snapper is not listed as endangered or vulnerable with the World Conservation Union (IUCN). The IUCN is a global union of states, governmental agencies, and non-governmental organizations in a partnership that assesses the conservation status of species. Whole lot of rain overnight but finally some sunshine as the day went on, and a high around 60. But a cold front moving in for the next couple of days. For Breakfast i prepared a couple of Jennie – O Turkey Breakfast Sausage Links, Toast, and a Sunnyside Up Egg. Love the Jennie – O Turkey Sausage Links. Fantastic flavor, only 65 calories per serving (2 Links), and fry up in about 15 minutes. Ran a couple of errands for Mom and that was about it for the day. 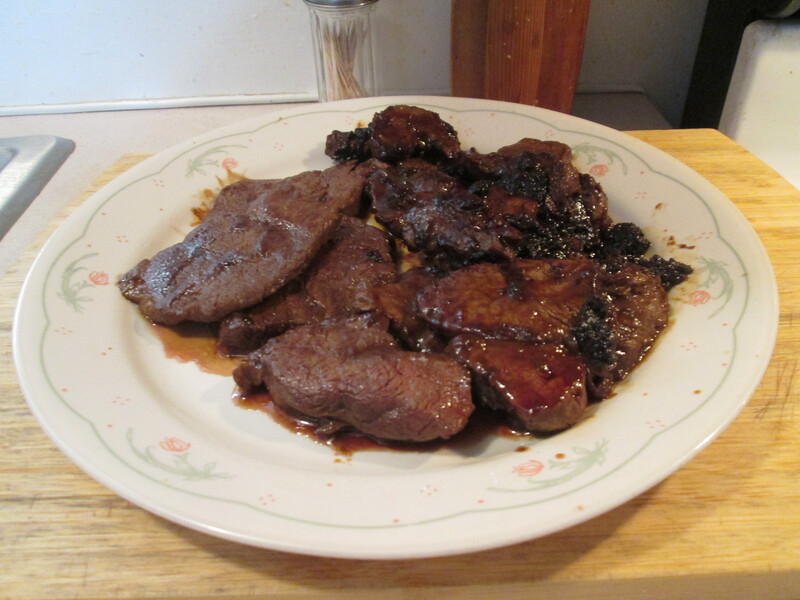 For dinner tonight I tried a Wild Idea Buffalo Product for the first time, Buffalo Tenderloin Tips. 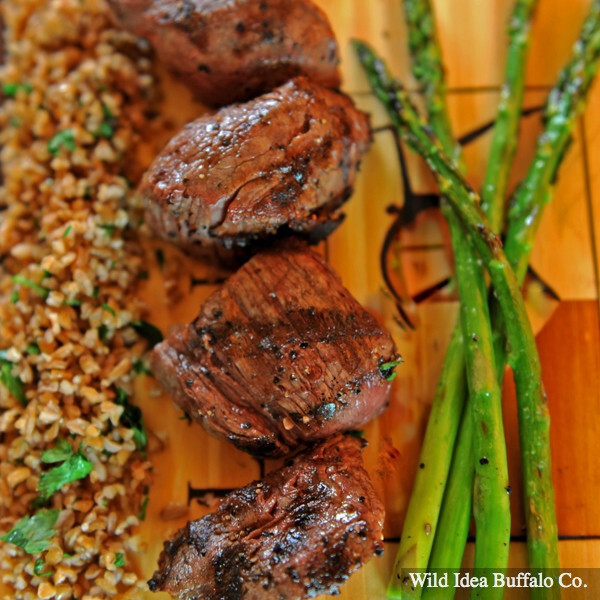 For dinner tonight it’s Marinated Buffalo Sirloin Tips w/ Multi-Grain Medley and Green Beans. I had purchased the Wild Idea Buffalo – 1 lb. Tenderloin Tips a while back on my last order from Wild Idea Buffalo. Had them in the freezer and let them thaw overnight in the fridge. To prepare them I’ll need; 3/4 cup Jack Daniel’s Honey SmokeHouse BBQ Sauce, 1/4 cup Worcestershire Sauce, and Garlic Powder, Sea Salt, Black Pepper (to taste). Then to prepare them, start by blending the BBQ Sauce, Worcestershire Sauce and Seasoning in a medium mixing bowl. Stir until the marinade is smooth. 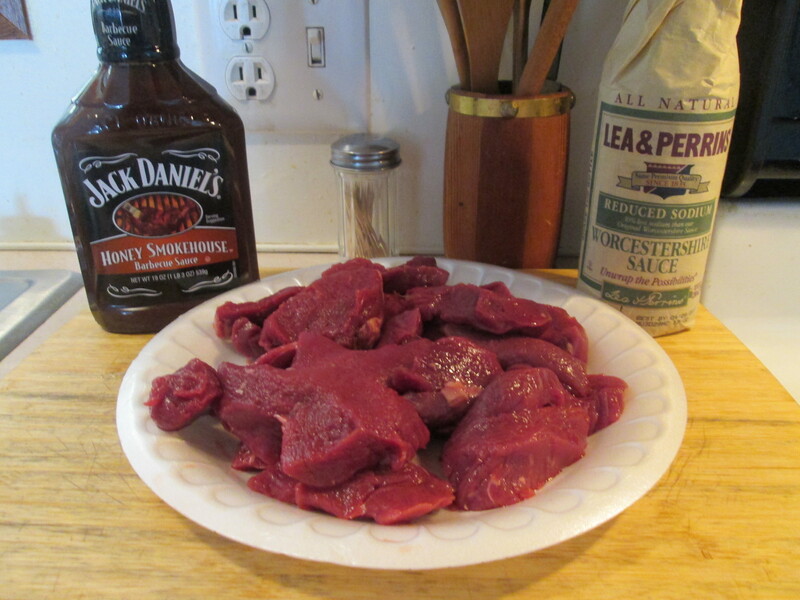 Add the Buffalo Steak Tips to the marinade and stir to coat them in the Marinade. Cover the bowl with a sheet of plastic wrap or fitted lid and refrigerate the steak tips for at least 2 hours. After 2 hours of Marination, preheat a skillet over medium-high heat. Transfer the steak tips from the marinade to the skillet. Discard leftover marinade. Stir the steak tips continuously for 10 minutes or until the meat is no longer red in the center. When using Buffalo Meat remember that Buffalo gets done quicker than other Meats. Be patient and do not increase the heat, as this could dry out the lean meat. 130° (medium-rare; don’t overcook). Remove the skillet from the heat and allow the steak tips to cool for five minutes. Serve the steak tips while hot and enjoy these babies! Tender, juicy, and just flat-out delicious is the only way to describe them. The Marinade worked perfect with the Buffalo. I’ll be ordering these quite often from Wild Idea Buffalo. Served it on a bed of Minute Multi Grain Medley. 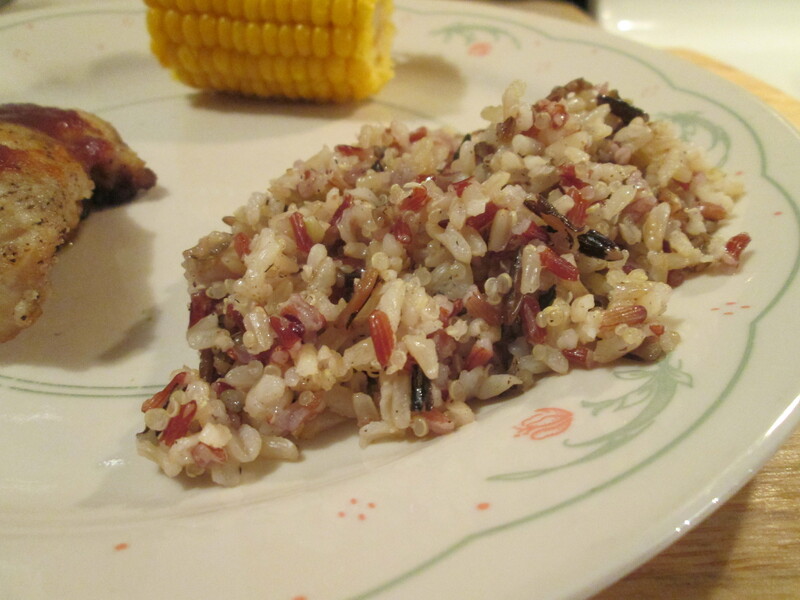 I love the Multi Grain, It has Brown Rice, Thai Red Rice, Wild Rice, and Quinoa. Now that’s a good combo of Grains! Plus it’s only 160 calories and 31 net carbs per serving. 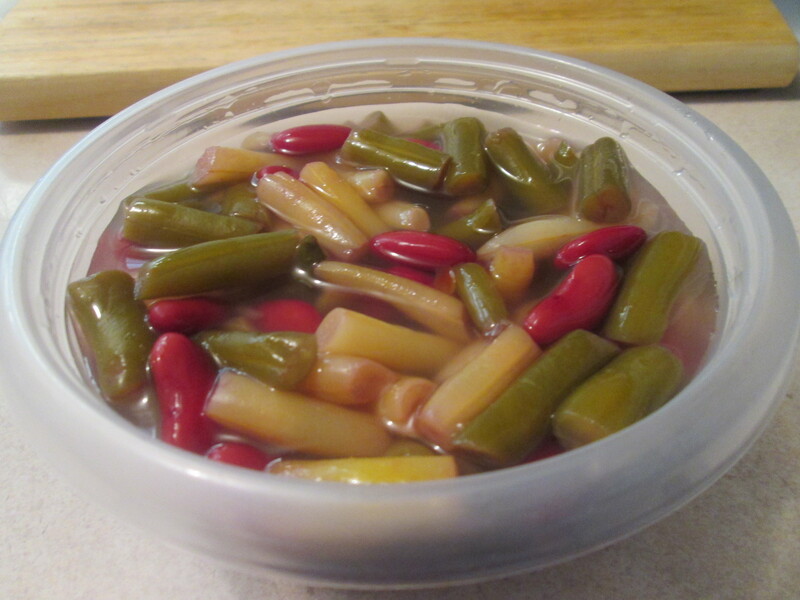 I also heated up a can of Del Monte Cut Green Beans and a few spears of Pickled Asparagus. First time I tried it, came across it the other at Kroger and wanted to give it a try. Produced by Forest Floor Foods. The good part besides the great flavor is there are no Calories, Fat Free, and only 1 Carb per serving (2 Spears). Fantastic side! Quite a Dinner tonight! For dessert later a Healthy Choice Dark Fudge Swirl Frozen Greek Yogurt. Fine cut medallions from the whole tenderloin. Our tenderloin tips are as juicy, tender, and delicious, as the premium filet. Versatile for the grill or skillet! 1 lb. package. Step 1 – Blend the BBQ Sauce, Worcestershire Sauce and Seasoning in a medium mixing bowl. Stir until the marinade is smooth. Step 2 – Add the steak tips to the marinade and stir to coat them in the liquid. Cover the bowl with a sheet of plastic wrap and refrigerate the steak tips for one hour. Bison steak tips will benefit from increased marinating time. Refrigerate them for two hours for best results. 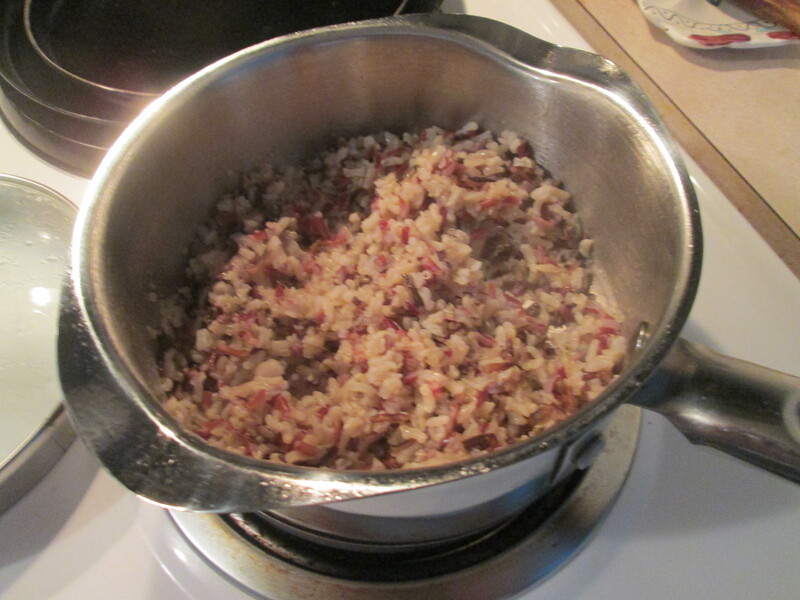 Step 4 – Stir the steak tips continuously for 10 minutes or until the meat is no longer red in the center. If you are working with bison steak tips, the cooking time might take up to 15 minutes. Be patient and do not increase the heat, as this could dry out the lean meat. 130° (medium-rare; don’t overcook). Step 5 – Remove the skillet from the heat and allow the steak tips to cool for five minutes. Serve the steak tips while hot. 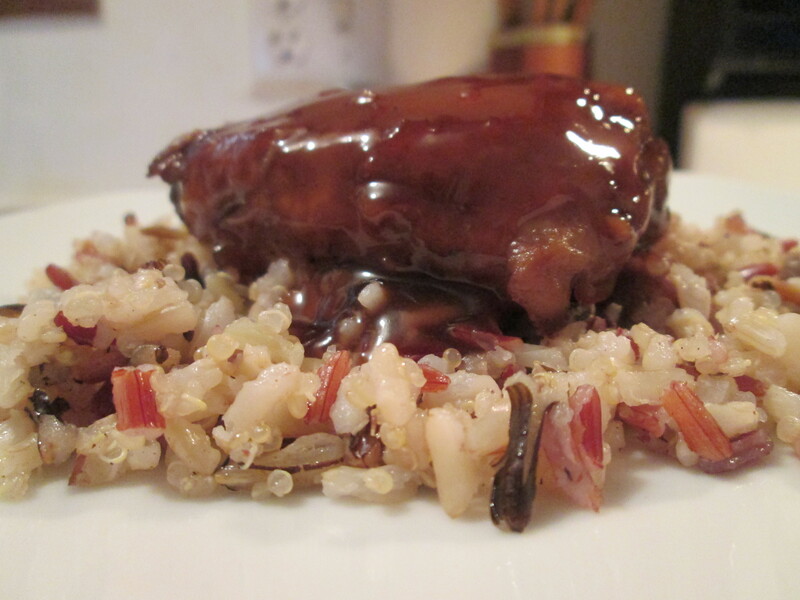 Cast Iron Roasted BBQ Glazed Chicken Thighs w/ Multigrain Medley and…. Well the Snow Storm stayed way North of us. We had rain, and not really a whole lot of that. At least everyone’s pantry and fridges are well stocked, too funny!! Anyway it was a laid back day around here today, not much going on. Did a little cleanup on the computer and that was it, sofa city after that! For dinner tonight I prepared Cast Iron Roasted BBQ Glazed Chicken Thighs w/ Multigrain Medley and Mini Ear Corn on the Cob. I used my favorite Chicken, Miller Amish Poultry. I’ll be using their Skinless and Boneless Chicken Thighs. I had them in the freezer so I let them thaw in the fridge overnight. To prep them I seasoned them with Garlic Powder, Sea salt, and Ground Black Pepper. Sprinkled a light coat of Flour on them and they were ready to make. Preheated the oven to 400 degrees F. I’ll be using my favorite skillet, the Cast Iron Skillet. Added 2 tablespoons of Extra Virgin Olive Oil and set the burner on medium. When the skillet was heated up I added the Chicken, just long enough to brown both sides. After flipping them over I added a glaze to them, I used JB’s Fat Boy Sticky Stuff BBQ Sauce. 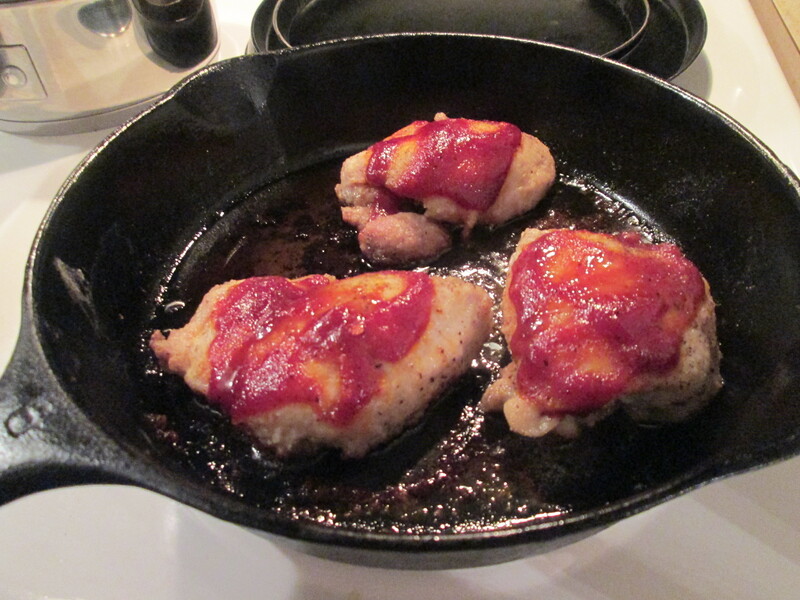 I then put the skillet in the oven to finish cooking the Thighs. Roasted them till I had an internal temperature of 165 degrees, using a meat thermometer. Roasted about 15 minutes and done! As I removed them from the oven I put another light glaze over the top and let them cool for 3 minutes before serving. The Thighs were moist and tender, with all kinds of flavor! These would make some great Chicken Thigh Sliders, which I’ll try sometime soon! I’ve been using Chicken thighs more and more, somewhat cheaper and just as good as any other cut. For one side I prepared some Minute Multi Grain Medley. 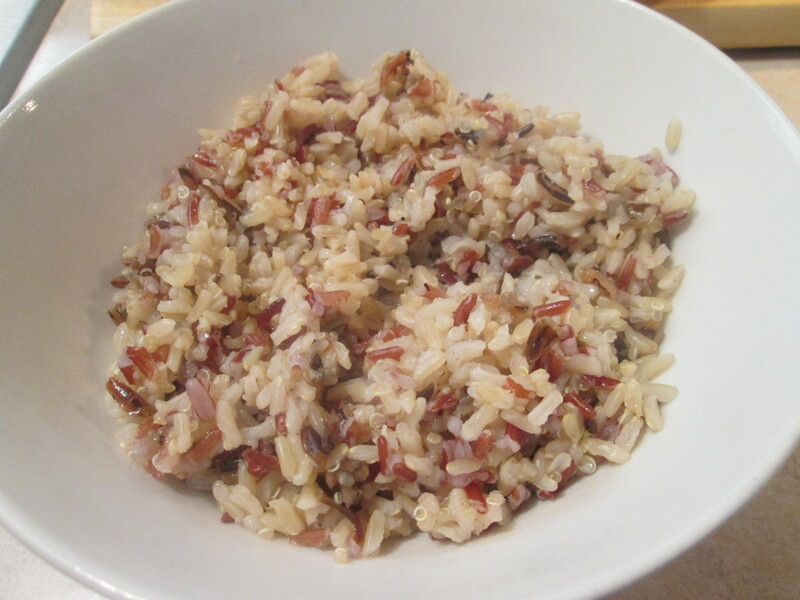 I love this Minute Multi Grain, It has Brown Rice, Thai Red Rice, Wild Rice, and Quinoa. Now that’s a good combo of Grains! Plus it’s only 160 calories and 31 net carbs per serving, which isn’t bad for a Grain Dish. Then I also boiled some Green Giant Mini Ears of Sweet Corn. As good and sweeter than some fresh Corn on the Cob. 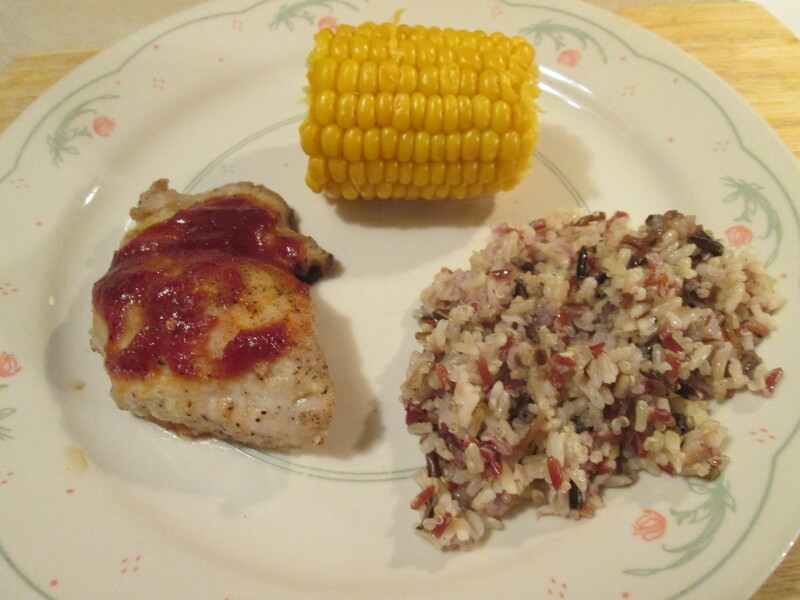 Chicken, Grains, and Corn make a fine Dinner! For dessert later a Healthy Choice Dark Fudge Swirl Frozen Greek Yogurt. Not a bad day here in west Chester today, partly sunny and a high in the upper 40’s. I had a doctor’s appointment at 10:30 this morning. My 2 year checkup to make sure my Hip Replacement is doing good on the inside, a couple of x-rays and a physical exam and done. Everything looked great! Then later ran Mom and Dad for a checkup at their Family Doctor. Too many Doctors today! 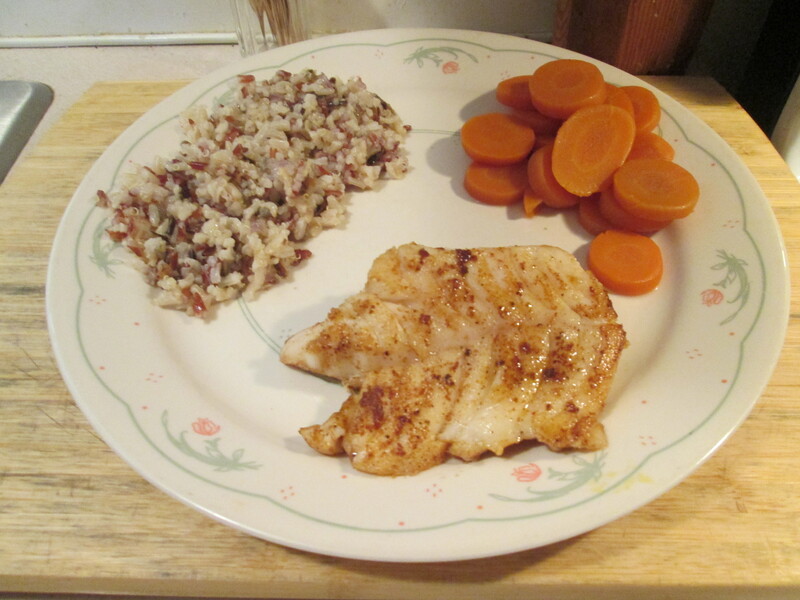 For dinner some Gulf Coast Grouper!, I prepared Blackened Grouper w/ Grain Medley and Sliced Carrots. Yesterday some good friends of mine returned from Florida and brought me some Gulf Coast Grouper that they had just caught days before there in Florida. They have a home in Southern Florida along the Gulf Coast and go down quite often. And they usually bring me back some Grouper or Snapper on their return. Thank goodness they love fishing! They had frozen the Grouper so I left it in the fridge overnight to thaw. To prepare it I rinsed the fillets off in cold water and patting dry and cut it into smaller pieces. I melted a tablespoon of butter, Blue Bonnet Light Stick Butter. I then brushed both sides of the fillets with the Butter and seasoned them with Sea Salt and then with Zatarain’s Blackened Seasoning. Then I got out my favorite skillet, The Cast Iron Skillet. 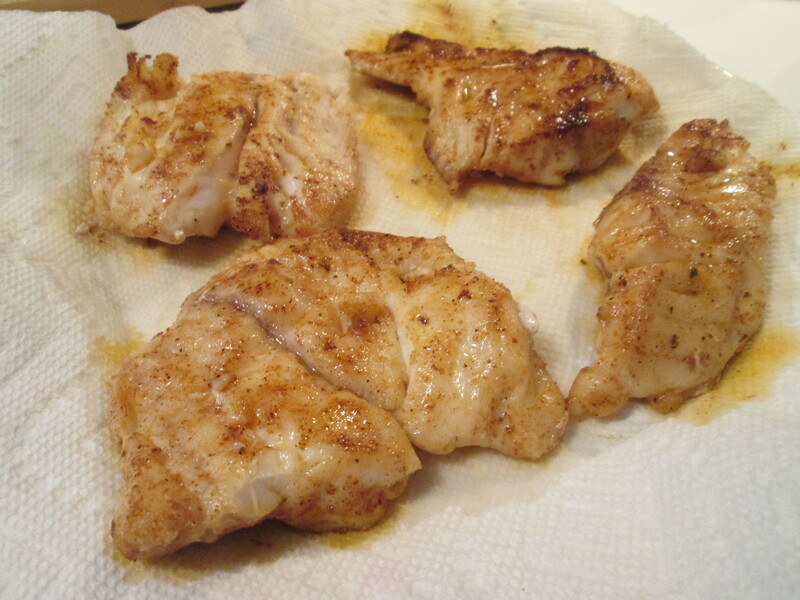 When the pan was fully heated, on medium heat, I added my Grouper. Cooked it about 4 minutes per side, and it was ready for the table! Cast Iron Skillets are perfect to use for any cooking but especially when Blacken something. The Skillet heats up and holds it heat and the heat evenly distributes across the Skillet, perfect for Blackening Meats. This fish turned out so good, hard to describe! Moist and bursting with flavor. Just something about Gulf Seafood. The Zatarain’s Seasonings are perfect for any Seafood. For one side I prepared some Minute Multi Grain Medley. I love the Multi Grain, It has Brown Rice, Thai Red Rice, Wild Rice, and Quinoa. Now that’s a good combo of Grains! Plus it’s only 160 calories and 31 net carbs per serving, which isn’t bad for a Grain Dish. Then I also heated up a small can of Del Mote Sliced Carrots along with a slice of Pillsbury Rustic French Bread, which was leftover from last night’s meal. For dessert later a Healthy Choice dark Fudge Swirl Frozen Greek Yogurt. A fish weighing from 5-15 pounds. 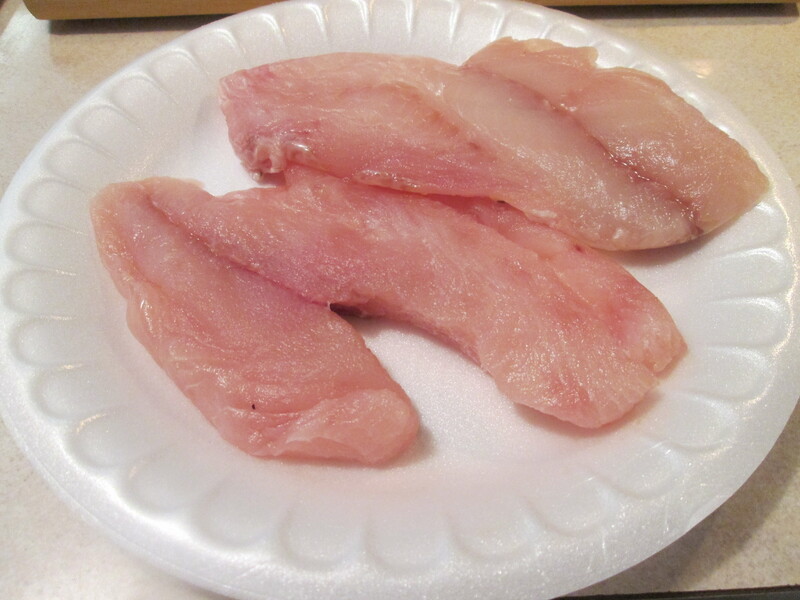 The flesh is lean and firm, but the skin is strongly flavored and should be removed before cooking. Popular varieties are the black grouper, Nassau grouper, red grouper and yellowmouth/yellowfin grouper. Well not too bad out there today, sunny but still cold. Better weather days are moving in for the rest of the week they say. A lot of sunshine and highs in the 40’s, sure beats a wind chill below zero! Stayed up late watching The Ohio State Buckeyes win the National Title, on the cell with best friend out in Arizona for most of it! Did a load of laundry and tidy up around the place. For dinner tonight a new recipe, Teriyaki Chicken Thighs and Multi Grain Medley. 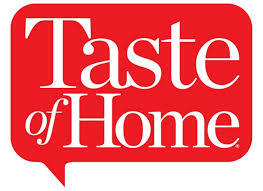 Another recipe from the Simple and Delicious – Taste of Home Magazine. The latest issue had quite a few recipes I want to try. So tonight it’s Teriyaki Chicken Thighs and Multi Grain Medley. To prep it I’ll need the following; 3 pounds boneless skinless chicken thighs, 1/4 cup and 2 Tbsp Splenda Sugar, 34 cup reduced-sodium soy sauce, 1/3 cup cider vinegar, 1 garlic clove (minced), 3/4 teaspoon ground ginger, 1/4 teaspoon pepper, 4 teaspoons cornstarch, and 4 teaspoons cold water. I was just cooking for myself tonight so I only used 1/4 of the amount of the ingredients, I made 2 Chicken Thighs. Place the chicken in a 4- or 5-qt. slow cooker. In a small bowl, mix sugar, soy sauce, vinegar, garlic, ginger and pepper; pour over chicken. Cook, covered, on low 4-5 hours or until chicken is tender. Remove the chicken to a serving platter; keep warm. Transfer cooking juices to a small saucepan; skim fat. Bring cooking juices to a boil. In a small bowl, mix cornstarch and cold water until smooth; stir into cooking juices. Return to a boil; cook and stir 1-2 minutes or until thickened. Serve with chicken. Winner, Winner Chicken Dinner! This turned out absolutely delicious! The Chicken Thighs were moist and tender and just bursting with that Teriyaki and spices flavor! Great addition by boiling the cooking juices and thickening it to a sauce for the Chicken. A “Keeper Recipe”, for sure! Served it on a bed of Minute Multi Grain Medley. I love the Multi Grain, It has Brown Rice, Thai Red Rice, Wild Rice, and Quinoa. Now that’s a good combo of Grains! Plus it’s only 160 calories and 31 net carbs per serving, which isn’t bad for a Grain Dish. For dessert later a Jello Sugar Free Dark Chocolate Pudding. Place chicken in a 4- or 5-qt. slow cooker. In a small bowl, mix sugar, soy sauce, vinegar, garlic, ginger and pepper; pour over chicken. Cook, covered, on low 4-5 hours or until chicken is tender. Remove chicken to a serving platter; keep warm. Transfer cooking juices to a small saucepan; skim fat. Bring cooking juices to a boil. In a small bowl, mix cornstarch and cold water until smooth; stir into cooking juices. Return to a boil; cook and stir 1-2 minutes or until thickened. Serve with chicken and, if desired, rice. Yield: 8 servings.